Welcome to the world of Neale Osborne, a realm of music, mischief and myth - of glamorous dancers and genius composers, stars of the stage and sirens of the silver screen, of fabulous beasts and curious insects, a realm of romance, whimsy and … confectionery. Over the past twenty years, Neale Osborne’s distinctive illustrations have been featured on posters, CDs, and dinnerware; in books, exhibitions, concert programs, and numerous periodicals. 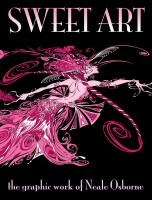 Collecting over a hundred eclectic and decorative designs, ‘Sweet Art’ is the first published retrospective of his graphic work - with images from myth, music and theater - plus, of course, children’s literature, with pictures inspired by the ‘Alice’ and ‘Oz’ books, along with a delicious selection from his own sweet-themed ‘Lydia’ novels. With pages of accompanying notes from the artist, this elegant black-and-white paperback comes in a generous 8.5” x 11” format.